If you are a man or if you have a man in your life you know there is an unspoken code of public restroom conduct for men. For example, guys don’t talk to the other guys while in the bathroom; guys don’t look down while using the facilities; and if there are multiple urinals open, guys need to leave one open in between himself and the other guy. Why don’t women have a similar code? I can’t tell you how many times I’ve been in a public restroom where women are trying to have a conversation with me over the bathroom stall wall while we are both using the facilities. Or, how about the woman who uses the public restroom as her own personal powder room and hogs the entire sink area so she can brush her teeth, curl her hair and get her make-up perfect for some imaginary photo shoot? Ladies, it must stop! Public bathrooms are not a place any of us should want to spend lengthy periods of time. They are stinky, germ-laden places designed as a public convenience to privately dispose of waste. While I know it has been done before (see the International Center for Bathroom Etiquette site), I am taking the liberty to create a working code of female conduct for public restrooms. Please feel free to add to it in the comments section as you see fit. 1. 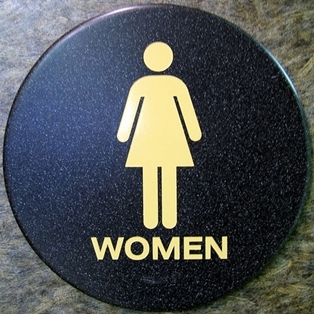 If you are in a conversation with another women while entering the bathroom, it must end within 15 seconds of either woman entering a stall. 2. When you exit the stall, wash your hands, dry them and get out. 3. If your cell phone rings while you are in the bathroom, do not answer it. The person on the other end of the phone does not want to talk to you while you are in the restroom and the other women in the restroom don’t want to hear your conversation. 4. Do not gossip in the bathroom. You never know whose feet are under the other stalls, plus conversations carry outside the main bathroom door. 5. If you must reapply your lipstick or brush your hair, step aside and do so after the other ladies have had the chance to wash their hands. Don’t monopolize the communal sink area. 6. If you enter the restroom with your friend, don’t feel that you have to clog up the limited space in the bathroom waiting for her. She may want privacy and even if she doesn’t, she is a big enough girl to come find you outside when she is finished. 7. If you see, hear or smell something askew in one of the stalls. Don’t feel the need to comment. Have some class and only discuss it with the other ladies in the bathroom if it will pose a hazard to them (i.e. an over-flowing toilet). 8. If you must change your clothes in a public restroom, have the courtesy to let other women waiting go ahead of you. If there is no one waiting before you go in to change, be sure to change your clothes swiftly in case some one gets in line after you’ve entered the stall. 9. Get ready at home. Do not use public restrooms as your private bathroom. 10. Keep idle chatter to a minimum. It is fine to compliment the woman at the sink next to you on her dress, but leave it at that. Strike up the lengthier conversation after you have both left the bathroom. I’ll never claim to be Miss Manners, but, like men, women need to have some public restroom guidelines.